Please stop reading, get up, and go look in each of your closets. What is your hanger situation? Don't worry, I have a plan. 1. Dry cleaners put clothes on hangers. 2. Brick and mortar stores leave the hangers on clothes and you walk out the store with them. 3. 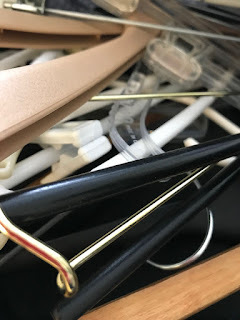 You watched HSN or some other TV show about 20 years ago and bought the Joy Mangano Huggable Hangers (now widely available in many places), and, since they are awesome, you bought dozens and dozens. 4. Your kid gave you a set of satin covered padded hangers because they were affordable and looked like something Mom would like. You said you loved them. So he did it again and again. And again. 5. You inherited someone else's hangers. 6. Hangers breed. It's a scientific fact that wire hangers + wood hangers = a very ugly hybrid hanger. If you doubt me, empty out a closet and leave only one wire and one wood hanger and leave them very close together. Turn off the light and shut the door. Wait 24 hours and there will be a new hybrid hanger that takes up more space than its parents. 1. If you think you are smarter than I and didn't look at your closets when I told you to do at the beginning of this article, then I cannot help you. Close your laptop, log off my blog, and go live in your hanger hell. 2. Ok, good. Now it's just those of us who get it. Breathe -- it gets better. 3. Take out all the hangers from your closets that do not have clothes on them. Put them** in a bag to toss, give away to someone who does not get it, or use the hangers for some "bless your heart" type of crafting. 5. Take a moment to be glad Joan Crawford wasn't your mother. 6. Take the clothes that were on the wire hangers and put them on your bed and apologize for how you've treated them. 7. Select one type of hanger that you like for tops and dresses and one for pants. Get rid of all your other hangers. MATCHY/MATCHY is ESSENTIAL. 8. If you need to, buy new hangers that match the type you've selected and rehang your clothes on them. 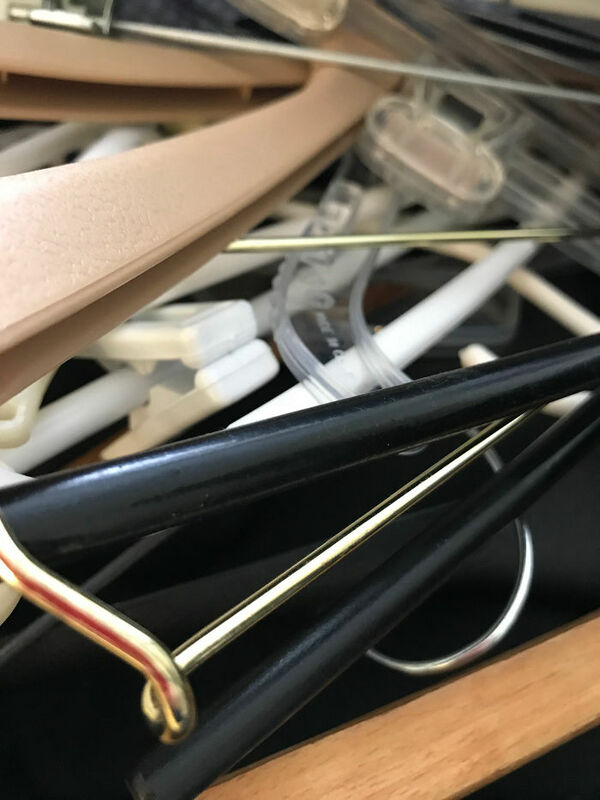 **Under Step 3, you many have thrown out some of your favorite hangers. Go back and get them. If you don't want to buy new hangers, then pack away the clothes that do not have proper hangers because that's the price you will pay for being stubborn. 9. You WILL hang your clothes in the same direction on the same type of hangers. You WILL put them on the closet rods in some logical order -- color, size, whatever. 10. You now have happy hangers. You are happy. It's early in the morning of another scorching hot and humid day in Harlingen, Texas. I step outside onto the deck of my late mother in law's mobile home, seeking to escape the non-stop air conditioning, but even at 6 am the humidity is so thick that I run back inside. Harlingen is tucked away in south Texas close to the Mexican border. It's a hard scrabble kind of town, with few pretty places, the obvious presence of the Border Patrol, and way too many fast food shops. It rarely rains, but it's got a real airport, is about 40 minutes to the Gulf, has a very low cost of living, warm winters, and a Cracker Barrel. Retirees from cold places in the US and Canada, as well as many transplants from Mexico, live there. It's the friendliest place I've ever visited. I'm here because my in laws chose to move to a mobile home retirement park in Harlingen about 20 years ago. After my mother in law died last month, the family decided to hold a memorial service here, and use the time to clean out her house to get it ready for sale. A lifetime of books and CDs and clothes and crossword puzzles and cat figurines and movies and pictures were parceled out to family and charity and neighbors. It was an honor to be part of it. In the middle of the time pressured chaotic cleaning, someone found all of my mother in law's belts and put them on the bed. I went over and separated them, looking at narrow belts and 2 inch wide leather belts and every other kind of belt. I couldn't remember my mother in law ever wearing a belt -- like many aging women she chose the comfort of elastic waist pants. These belts told of a different time, when I imagined her dancing with my father in law, her waist cinched in a wide belt, her skirt twirling with the music. Those days passed; my father in law died, and the belts eventually hung in her closet waiting for the moment when someone would take them away. My mother in law told me once that she couldn't imagine living without my father in law. But she did, spending much of her 10 years as a widow volunteering at the local food bank and the VA medical clinic, playing cards and bingo, and going to dances at the mobile home park. Even without a belt, she always found someone happy to take her out for a spin on the dance floor. Now her belts and almost everything else are gone. The house is empty. My sister in law is still asleep. It's just the two of us now. I sit here listening to nothing except the heavy hum of the air conditioner. My father in law's jokes and outlandish statements and my mother in law's no nonsense laughs and hugs are gone. The TV, which used to host the Sopranos, and eventually was set almost full time to the Game Show Network, is quiet. I miss my mother and father in law. Couples, like my in laws, who stayed together through the best and worst of times, lift up all of us. We all know couples like my in laws -- the early black and white pictures of thin, dark- haired people leaning together, dressed in their finest, gradually turning to heavier frames wearing funny t-shirts, and then, graying hair and shrinking bodies, smiling from their twin recliners. These couples built a life on hard work and the knowledge that life owed them nothing. They were good and decent people who left behind good and decent children who, hopefully, will find themselves smiling from twin recliners some day.